I can’t remember the time I saw a film so incredibly inoffensive. Usually, as a film writer, one is often attracted to a film with an intense, diverse reaction. 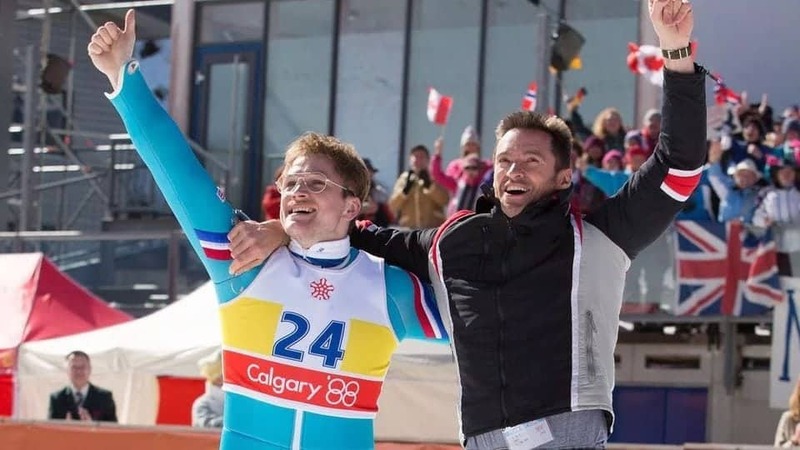 Dexter Fletcher’s Eddie the Eagle; the colourful true story of Eddie Edwards, the tenacious underdog whose passion and charm, managed to win enough people over and gain a chance to complete in the 1988 Winter Olympics, is only interested in warming the hearts of those who take a chance to watch it. The film, like its protagonist, only wants the audience to be willing to give it a go. It’s a nice sentiment. Eddie the Eagle’s home release timing may still be able to deliver a vivid reaction. Even if accidently. I highly doubt that Fletcher’s film is aiming for any sort of socio-economical leanings (the closest we get visually is Charles and Diana salt shakers). However, the film’s relatively harmless message of a working class British throwing caution to the wind, never giving up and going their own way in spite of what the so-called elites/experts say, gains an extra dramatic strand as we Brits wait in Brexit limbo to see if Article 50 gets activated. Safe to say, in watching Eddie the Eagle, it’s probably not making reference to anything like that. The mind can’t help marvel at the timing though. In reality or rather cinematic fictional reality, Eddie the Eagle is simply a British Cool Runnings. Glistening with bold colours and running on good ol’ British gumption. A story of a boy who comes good, even if he’s not very. Fletcher is quickly making himself the go-to British director for productions that wish to make unique takes on the idea of a feel good film. His debut Wild Bill (2011) is a charming and skilful take on the type of London criminal flick that’s been done to death. Sunshine on Leith (2013) is a romantic musical utilising The Proclaimers of all bands. With Eddie the Eagle, Fletcher looks to warm the heart with a ski jumper whose true story was allegedly so embarrassing to the establishments involved, that Olympic qualifications were changed to stop a similar story from happening again. The film is so handsomely British, it’s tough not to smile at its antics, even when it’s going over the well-known tropes (A sports film set in the 80’s? Time for a montage!). The fact is Eddie the Eagle enjoys skewing the American ideal of being the underdog who overcomes adversity to claim victory. This takes the very British route of being the underdog who just wants to have a seat at the table. It’s not so much about the spoils of victory, but just being allowed to have a seat available to have a piece of the pie. While in real life, requirements have tightened, in the film world, we’re again given the chance to remind ourselves of sports people whose character is just as entertaining as their feats. The titular Eddie is played charmingly by Taron Egerton, who sometimes steers the milk drinking Edwards a tad too much into the realm of cartoonish and goofy. That said, he still manages to give a heartfelt sensitivity and shows that the actor is more than able to leave his cocky Kingsman (2015) persona behind him if he wishes. Not much needs to be said about co-star Huge Jackman. Not because he’s bad, but because he can deliver his (fictional) coach role with such ease, he could have done it while sleeping. With all the talk about other more prominent British directors making cinematic waves, we should remember to keep an eye on Fletcher, whose made the leap from acting to directing seem simple, and is slowly grafting a solid body of warm, distinctive work. With Eddie the Eagle, Fletcher manages not only to put together some effective set pieces, he makes sure that the films 80’s aesthetics don’t overcrowd it’s simple but pleasant story something that a film like this could have easily fallen down on. Eddie the Eagle is a light piece of true life inspiration which one can easily see being re-watched over Christmas for years to come. Eddie the Eagle is out on digital download from 1st August and DVD from 8th August.